Spring is such a wonderful time of year for the herbalist and gardener. I am pleased to present an amazing collection of Spring Herbs blog posts this month. Make yourself a cup of herbal tea and settle in a while to read what others are doing with herbs this time of year. What are you doing with herbs? We would love to know, so leave us some comments. For more information on ongoing blog parties visit the Herbwifery Forum. ~Tina Sams of from the Essential Herbal gives us a tour of emerging Spring herbs in Pennsylvania. 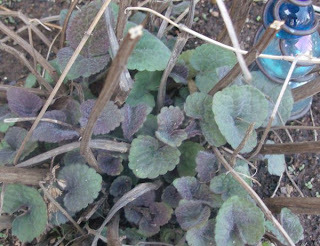 Her Anise Hyssop photo is featured in this blog post. ~Cindy Jones of Sage Script also shows us what herbs are coming up in Colorado, and discusses plans for herbal planting. ~Sarah Head of Tales of a Kitchen Herbwife in England shares a richly descriptive post on the first medicines of spring. ~Lady Barbara of Lady Barbara’s Garden in Oregon takes us on an exuberant Alice in Wonderland stroll finishing up with a treasury of Violet Magic. ~Beth Brynne of the Garden Meanderings blog in Western New York also discusses emerging Spring Plants. ~Karen Creel of Garden Chick suggests planting a Mosquito Repellant Garden for Spring. ~Visit Maggie McMillan’s lovely farm. What beautiful animals she has. Maggie shares about making biiter Dandelion coffee and Dock syrup. ~Yael Grauer of Dirt Time is also “Embracing the Bitter” this month. Check out her post on Horseradish. ~Karen Vaughan of Acupuncture Brooklyn discusses the challenges and opportunities of Spring Time Urban Gardening. ~Here at Aquarian Bath, my contribution to the blog party is Shapshots from my Spring day in the Garden at Fair Share yesterday. You will definately want to check out the new and unique “US mint” bed we started yesterday. Good morning, I want to express gratitude for an informative website about a topic I have had an interest in for years now.I have been lurking and examining the posts avidly so just wanted to express my thanks for providing me with some very good reading material. I look forward to more, and taking a more active part in the discussions here, whilst learning too!! Very interesting blog on herbs. I was educated in England and very keen on herbal remedies, now I’m back in Malaysia and carry on learning more about tropical herbs. If you don’t mind what is the best remedies for prostate problems.